In 2017, The Lord Mayor of Chester, Razia Daniels chose Dial West Cheshire as one of her chosen charities of the year. This was an absolute honour for us and a very rare position to be awarded. As well as Dial West Cheshire, The Lord Mayor also chose to support fellow local charities, The Unity Centre (CHAWREC) and St Mary’s Handbridge Community Centre. 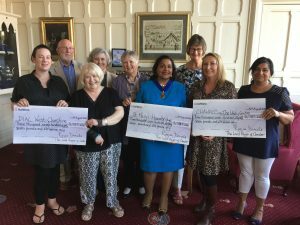 Throughout the year, the committee of charities along with The Lord Mayor, Razia Daniels, organised a number of fundraising events including ever popular supper clubs all in aid of three charities. The Lord Mayor alongside her three chosen charities of the year. We are incredibly humbled to have been afforded the opportunity and would like to extend our thanks once again to The Lord Mayor of Chester 2017-18, Razia Daniels for choosing our charity for the opportunity. It is valuable donations like these that enable our largely volunteer-led organisation to do the valuable work it does for disabled people in our community. We are always looking for more ways to fundraise. If you think your organisation would like to select us as charity of the year or hold a fundraising event, please get in touch with our fundraising team and we can work with you to create something spectacular.